The Young and the Restless (Y&R) spoilers for Wednesday, September 20, tease that Hilary (Mishael Morgan) will fill Jordan (Darnell Kirkwood) in on some big news. She’ll state that Cane (Daniel Goddard) and Lily (Christel Khalil) are at marriage counseling. Jordan may not believe they can repair the damage, but Hilary will have faith in them. She’ll suggest they’re committed to making it work. Unfortunately, that seems to be wishful thinking on Hilary’s part. Cane truly wants his wife back, but Lily isn’t ready to forgive and forget. At their therapy session, Cane’s words will get Lily riled. She’ll probably contend that Cane still isn’t taking responsibility for his actions. The Young and the Restless spoilers say Lily will decide she’s had enough. She’ll blow her top and make a bold move. Lily will declare that she’s sorry, but she can’t do this. She’ll walk out of the session and Cane will be left to pout. Elsewhere, Nick (Joshua Morrow) will give Chelsea (Melissa Claire Egan) a warning. He’ll feel like Victor’s (Eric Braeden) next wave of destruction must be on the way. As much as Nick hates it, Chelsea (Melissa Claire Egan) is part of this now. She’s siding with Nick and that means she could easily become a target as well. Nick will insist that when Victor’s involved, you have to be prepared for anything. Victor could come at them with unique, sinister tactics. The Young and the Restless spoilers say Nick won’t want Chelsea to let her guard down. She’ll promise to watch out for Vic, but that could be tough thanks to Victor’s new partner in crime. Meanwhile, Y&R spoilers hint that Victor will grow impatient. 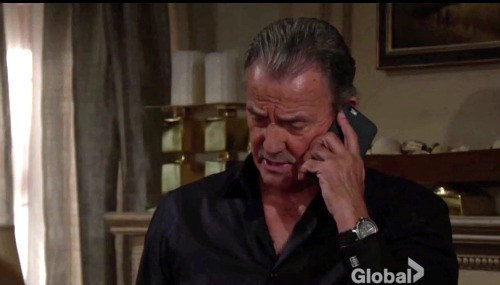 He recently made an intriguing call and asked someone to return to Genoa City. On the phone again, Victor will ask if his accomplice has arrived yet. He’ll announce that he’s waiting at the ranch and wants to get together ASAP. Since we know Wednesday is Kevin’s (Greg Rikaart) return airdate, it looks like he’s the one Victor is counting on. There’s a good chance Vic will face some resistance, but he’ll manage to get what he wants. Victor is a control freak and he’s certainly got a tight grip on Kevin. He could spill Chloe’s (Elizabeth Hendrickson) location if Kevin doesn’t cooperate. What will Victor ask Kevin to do? Just how disturbing will this scheme get? We’ll give you updates as other Y&R details emerge. Stay tuned to the CBS soap and don’t forget to check CDL often for the latest Young and the Restless spoilers, updates and news.